I wanted to put a quick post together on a special trip I just had the opportunity to take. It was not a long ride, instead a trip to our nation's capital to advocate for disability rights. I am posting this here because it was my first trip representing Ian's Ride in an official capacity. 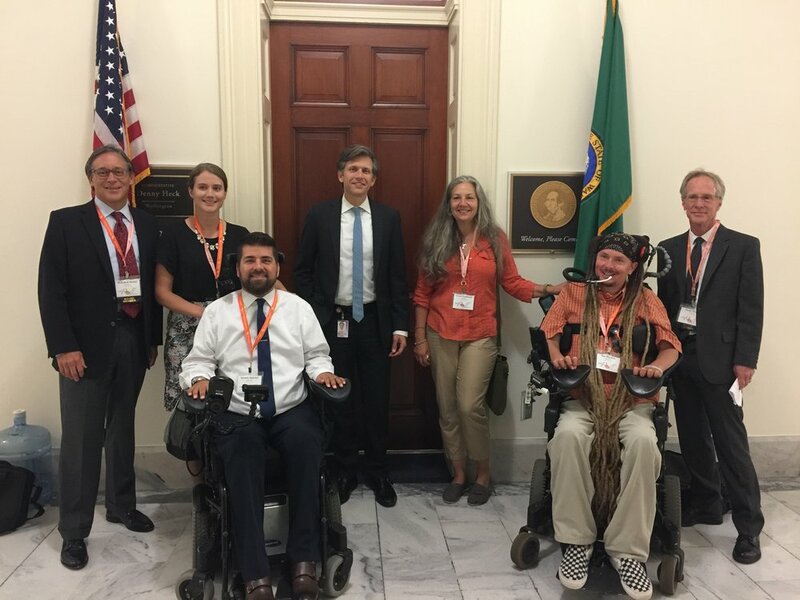 One of my closest friends, Kenny Salvini, went to the Roll on Capitol Hill organized by United Spinal in 2016 and 2017 representing his nonprofit The Here and Now Project, which I'm also on the board of. He told me what an amazing experience it is, and I figured I had to see it firsthand. I was skeptical at first because the two prior times he has gone, his chair did not return in one piece. I had only flown once before, and it was successful. I'm thinking Kenny was hoping we could have similar luck on this trip. The flight there went great, it was a very early morning flight and we were both wrapped in something called a comfort carrier that helps the airline staff move us from our chair to the aisle chair and then from the aisle chair to the seat. We both looked a little like Hannibal Lecter, but our bodies and chairs made it to DC unscathed. After arriving, the heat and humidity quickly reminded me that I was no longer in the PNW. We made our way down to the Metro where we caught our first train heading towards our hotel. We managed to get ourselves lost a few times but eventually found our way. The Metro is quite accessible but also quite time-consuming for a pair of large power wheelchairs to navigate. The main problem is the elevators. You generally take one from the street to the mezzanine and then another from the mezzanine to the train level. These elevators are old, rickety, often smell like urine, and in no way would fit both chairs. So, we would do the elevator dance one at a time. Overall, the Metro was a great way to get around, and if I lived in DC I'm sure I would use it often. Day two of the trip involved cramming a lot of knowledge into our heads about policy, interacting with legislators, and scheduling the next day. United Spinal did a fantastic job of organizing the day so that different panels could discuss different policies so that we would be in the know when we spoke to our senators or congressperson. The main topics we discussed were: keeping the ACA intact, opposing limitations on the ADA, and supporting laws that make air travel more accessible. I learned a ton and met some amazing people. Speaking of the people… I met so many wheelchair users with incredible attitudes that are undertaking such cool stuff! Many of them have their own nonprofit, many others are instrumental in causing change in their communities, and all of them held themselves with style and grace. I was honored to be among them. After meeting the good people and learning a ton, my mom and I had a couple hours to see the sights. We saw the White House, the Washington Monument, and tried to get some birding in. The sightseeing was much more successful than the birding. The parks were small, and the most exciting thing we saw was a grackle. I'm determined to see more of the countryside next time I'm out that way. We finished the evening having dinner with a good friend of Kenny's wife Claire, and I got to sample a couple local beers. On the third day we rolled on the Capitol. I visited the offices of two different Washington state congressman and spoke with staffers of both Patty Murray and Maria Cantwell. I felt they were quite receptive to the message we were delivering, and they encouraged us to continue speaking out if we really wanted change to occur. After the day of advocacy, we had a wonderful reception at the Capitol where I got to meet even more great people in the disabled community. One person of note was a man named Earl Powdrell. We had joked that I was likely to be the most paralyzed person there. I was nowhere close to that. Earl suffered a stroke in the brainstem seven years ago which left him with locked in syndrome. He can only blink his eyes and move his eyebrows slightly. This did not stop him from being an amazing advocate and a huge inspiration to many, including me. He was a rocket scientist who worked for NASA before becoming locked in and he is still just as sharp as a tack. He received an award for his exceptional work in advocacy and delivered a prepared speech in a similar way to what Stephen Hawking would use. It was beautifully written and really pulled at my heartstrings. I was so honored to meet him and see how little physical function is needed to still have a huge impact on the world. Our final day started out with having coffee with Patty Murray. We were there with a bunch of other Washingtonians and she spoke briefly on some of the important issues in the Senate right now. We then went back to the hotel to pack and send our luggage to the airport with Kenny's all-star caregiver Amanda. After being unburdened by the luggage we went out for a few more hours on one final sightseeing trip. One notable experience was crossing the East Coast Greenway Trail. This is a trail that goes from Florida to Maine. It has been on my radar, and I really hope one day to ride a big portion of it. We then went searching for monuments and memorials. Kenny suggested the FDR Memorial, and it turned out to be a true highlight. As we rolled through the Memorial with quotes engraved on the walls around us, I discovered what a great man FDR was. He overcame so many physical challenges and accomplished so much with his life. Kenny and I had to get a picture of us knee to knee with a statue of him in his chair. I'll remember that experience for years to come. After FDR, we went back to the Metro and made our way to the airport. After a long wait at security we boarded our plane in our straitjacket like slings. The flight went well up until I exited the plane to find my wheelchair had been damaged. The backrest, armrest, and headrest were not as they should have been, and it was clear my chair had been manhandled and put on its side. It was still in good enough shape where I could transfer into it and was able to make it home. Fortunately, this was my backup chair and I had my new one waiting at home. Alaska Airlines was quick to follow-up the with the ball already rolling for the needed repairs. This is crucial, because I will need this backup chair for my big ride in August. Fingers crossed it's back in working order by then. To wrap this up, it was an amazing trip with a great bunch of people, and I really feel like we made a difference. I was able to travel with two wonderful friends, Kenny and Claire. It's fun to travel with someone with similar mobility challenges. We shared many laughs, and I would love to do it again. The real unsung hero was my mom. We both survived on very little sleep, and she had to put up with me day and night. I couldn't have done this amazing trip without her, and I'm fortunate to have such a strong, enduring mother. We both felt it was an amazing experience and well worth the missed sleep.